10 Fairfield is located on the east side of Fairfield, between Beacon and Marlborough, with 8 Fairfield to the north and 12 Fairfield to the south. 10 Fairfield was designed by Sturgis and Brigham, architects, and built in 1879-1880 by Weston & Shepard, builders, one of two contiguous houses (8-10 Fairfield) designed as a symmetrical pair with stepped (curvilinear) Dutch-style gables. Henry Lee Higginson, an investment banker, is shown as the owner on the original building permit application, dated November 12, 1879; he did not own the land on which the houses were built and it is unclear why he is shown as the owner on the permit application. 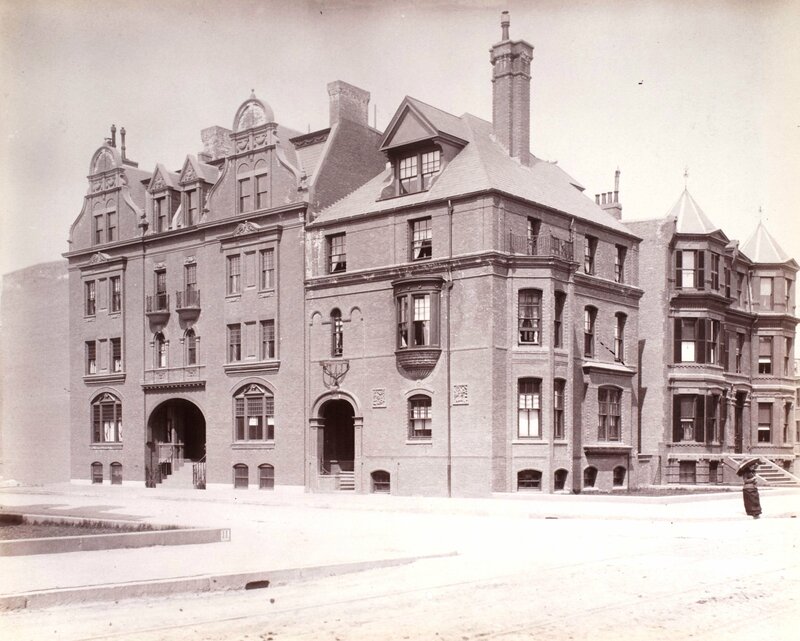 All three lots were part of a larger parcel originally purchased from the Boston Water Power Company on February 16, 1863, by Daniel Davies, Jarvis Dwight Braman, and Grenville Temple Winthrop Braman. Grenville Braman was treasurer of the Boston Water Power Company, Jarvis Braman was his brother (and later president of the company), and Daniel Davies, a housewright and master carpenter, was Grenville Braman’s father-in-law. Click here for an index to the deeds for 10 Fairfield and for a plan of the original land. On October 1, 1881, 10 Fairfield was purchased from John L. Gardner by Charles Goddard White, a wholesale grocer. 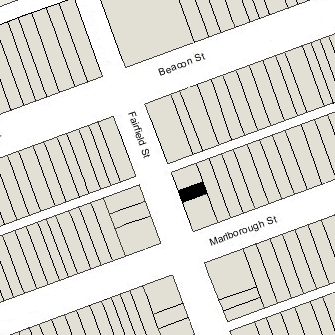 In the deed, John Gardner included an easement for a ten foot strip of land behind 10 Fairfield, connecting with the comparable strip behind 12 Fairfield, to give 8 Fairfield access to Marlborough Street. Charles White and his wife, Katharine Stanley (Pierce) White. made 10 Fairfield their home. They previously had lived in Milton, where they also continued to maintain a residence. On August 23, 1892, Charles White transferred the property into his wife’s name. The Whites lived at 10 Fairfield until about 1901, when their Milton home became their sole residence. On January 1, 1902, Katharine White transferred 10 Fairfield to their son, attorney Frank Stanley White, and on September 18, 1909, he transferred it into a trust for his mother’s benefit, with himself and his brother, Goddard M. White, as trustees. During the 1901-1902 winter season, 10 Fairfield was the home of architect William Ralph Emerson and his wife, Sylvia Hathaway (Watson) Emerson. Their usual residence was in Milton. 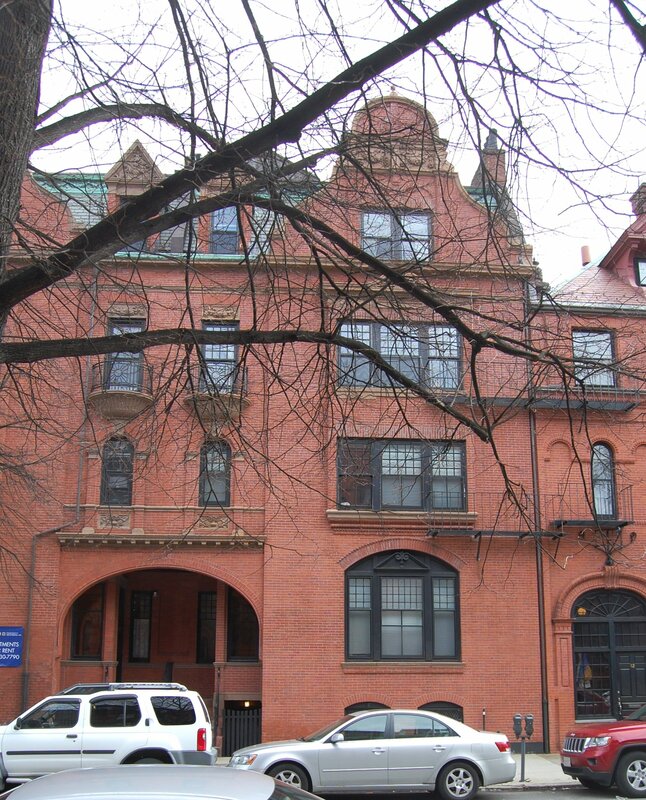 10 Fairfield was not listed in the 1903 Blue Book. By the 1903-1904 winter season, it was the home of cotton broker John Arthur Brooks and his wife, Mary Ten Eyck (Oakley) Brooks. They previously had lived at 6 Gloucester. They continued to live at 10 Fairfield in 1908, but had moved to Milton by 1909. 8-10-12 Fairfield and 279 Marlborough (ca. 1883), photograph by Albert Levy; Ryerson and Burnham Libraries Book Collection, The Art Institute of Chicago (Digital file #000000_100709-15). By the 1908-1909 winter season, 10 Fairfield was the home of Dr. John Lewis Bremer, Jr., professor of histology at Harvard Medical School. and his wife, Mary Cleveland (Bigelow) Bremer. They previously had lived at 18 Fairfield. They continued to live at 10 Fairfield in 1910. 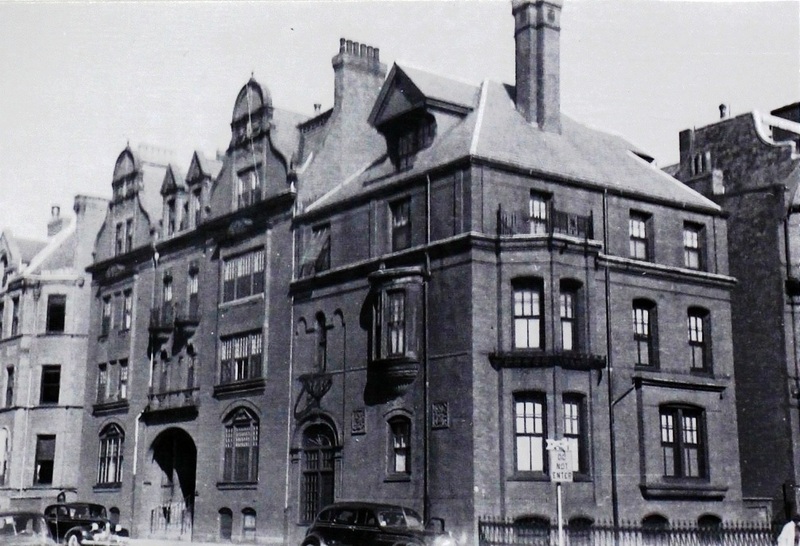 In mid-1911, they purchased and subsequently moved to 295 Marlborough. On June 10, 1910, 10 Fairfield was purchased from the White family by stockbroker Archibald Blanchard. He and his wife, Elinor (Whitney) Blanchard, made it their home. They previously had lived at 1091 Boylston. They continued to live at 10 Fairfield during the 1916-1917 winter season, but moved thereafter to 204 Commonwealth. On May 1, 1917, 10 Fairfield was acquired by real estate dealer William J. Stober, who transferred it the same day to Florence N. (Williams) Loizeaux Dowling, wife of real estate dealer Mark Temple Dowling. September 5, 1917, 10 Fairfield was acquired from Florence Dowling by Frances Moseley (LeMoyne) Stevenson, the wife of banker and stockbroker Thomas Greely Stevenson. They previously had lived at 124 Bay State Road. Frances Stevenson transferred 10 Fairfield to her husband on June 11, 1920; they moved soon thereafter and subsequently divorced (Frances Stevenson married again in October of 1923 to Henry Lee). On August 25, 1920, 10 Fairfield was acquired from Thomas Stevenson by Alvan Tracy Simonds. He and his wife, Susan Gansevoort (Lansing) Simonds, made it their Boston home. Their primary residence was in Fitchburg, where he was president of the Simonds Saw and Steel Company. 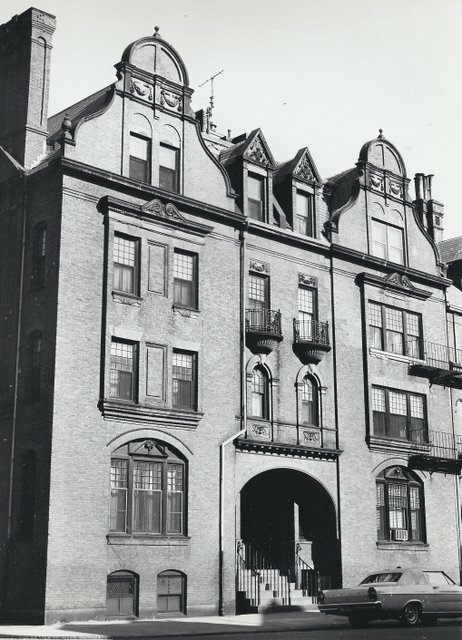 They continued to live at 10 Fairfield in 1924, after which they made Fitchburg their year-round home. On June 23, 1924, 10 Fairfield was purchased from Alvan Simonds by Richard Olney. 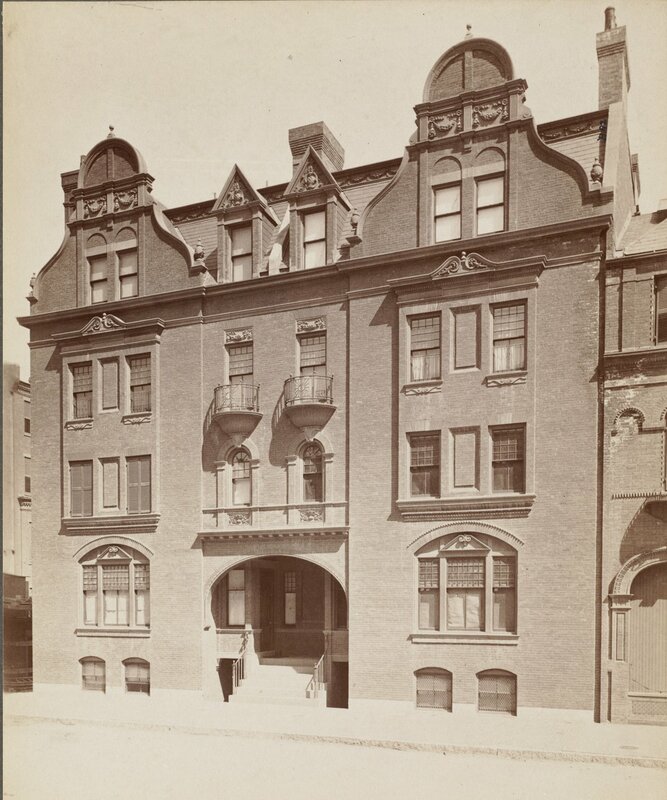 He and his wife, Anna Kerr (McCullagh) Olney, lived in an apartment at The Grosvenor at 261 Beacon. During the 1924-1925 winter season, 10 Fairfield was the home of investment banker Paul Graham Courtney and his wife, Dorothy (Morgan) Courtney. Their principal residence was at Wellesley Farms. They moved from 10 Fairfield by the next season and in mid-1926 purchased and moved to 239 Marlborough. By the 1925-1926 winter season, the Olneys had made 10 Fairfield their home. They also maintained a home in Woods Hole. During the 1926-1927 winter season, the Olneys were traveling abroad and 10 Fairfield was the home of William Glover Rueter and his wife, Margaret (Margot) Putnam (Cushing) Rueter. They previously had lived at 284 Beacon. William Rueter had been a brewer in his family’s firm, Rueter & Co. By 1927, he was treasurer of Franklin H. Palmer Inc., an import and export company. By the 1927-1928 winter season, the Rueters had purchased and moved to 326 Dartmouth and the Olneys had resumed living at 10 Fairfield. They continued to live there in 1932, but had moved to Brookline by 1933. By the 1932-1933 winter season, 10 Fairfield was the home of William Cabot Bramhall, a salesman, and his wife, Christine (Dexter) Bramhall. In 1932, they had lived at 1 Exeter. They continued to live at 10 Fairfield in 1935, but had moved to 62 Beacon by 1936. On November 13, 1935, 10 Fairfield was acquired from Richard Olney by the Franklin Savings Bank of the City of Boston. The house was not listed in the 1936 and 1937 Blue Books, and was shown as vacant in the 1936 City Directory. On March 15, 1938, the Franklin Savings Bank transferred 10 Fairfield and a number of other properties it had acquired, largely through foreclosures, to Charles S. Kimball. On the same day, he entered into a mortgage with the bank secured by all of the properties, and then transferred them to the Boston Management Corporation, a real estate management firm. On September 27, 1943, the Boston Management Corporation transferred 10 Fairfield and a number of other properties back to the Franklin Savings Bank. The property changed hands and on September 13, 1948, was acquired by real estate dealer Paul Gerard Donahue. In December of 1948, he applied for (and subsequently received) permission to increase the number of units from four to five by dividing the apartment on the first floor. In March of 1949, he applied for (and subsequently received) permission to increase the number of units from five to six by adding an apartment in the basement. On December 31, 1953, Paul Donahue transferred 10 Fairfield to Marlboro Street Realty, Inc., of which he was the president. He also owned 12 Fairfield and transferred it on the same day. In September of 1954, Marlboro Street Realty filed for (and subsequently received) permission to increase the number of units from six to eight by dividing the units on the second and third floors. On September 21, 1976, Marlboro Street Realty transferred 10 Fairfield back to Paul Donahue (it had sold 12 Fairfield earlier that year). Paul Donahue died in February of 1989. On November 13, 1990, 10 Fairfield was purchased from the estate of Paul G. Donahue by Clifford J. Schorer, III. 10 Fairfield subsequently changed hands. It remained an apartment building in 2015.